The Promotional Code asset allows customers to receive discounts on items when entering store promotional codes. These discounts are rule based, determined by either Fixed Amount or Percentage promotional rules. The Details screen allows you to set up the Promotional Code asset. For more information about the Status, Future Status and Thumbnail sections, refer to the Details Screen chapter in the Asset Screens manual. The section allows you to configure the promotional code and the assets it is applied to. The Details section of the Details screen is shown in the figure below. Name: enter a name for the Promotional Code. By default, this will be the name that was entered when the asset was first created. Promotional Code: enter a code to use for the Promotional Code asset. This will be the code customers must enter to receive a discount. This code is case-sensitive and can include special characters (e.g. $, % or @). Applied Assets: select the assets to apply the Promotional Code to. You can select multiple assets by clicking on the More... button. Tip: To allow Promotional Codes to be used on items, enable the Accept Promotional Code option on the Details screen of the Product asset. For more information, refer to the Product chapter in this manual. This section allows you to configure conditional rules against which the Promotional Code will be measured against before being applied on the e-commerce order. The Promotional Conditions section of the Details screen is shown in the figure below. The Compare Value condition allows you to compare two values on the e-commerce order, based on a variety of comparison types. This condition can be used, for example, to provide a discount to only Australian users of your store, or for users of a specific membership level. Delete Condition: select this checkbox and click Commit to delete this condition. Source Value: enter the source value to compare with the value entered in the Compare Value field. You can use global keywords in this field. Compare Value: enter the comparison value to compare against the value entered in the Source Value field. You can use global keywords in this field. String: Exact match, Begins with, Ends with, Contains. Numeric: Equals, Less than, Greater than, Less than or equals, Greater than or equals. Regular Expression: Match, Not match. 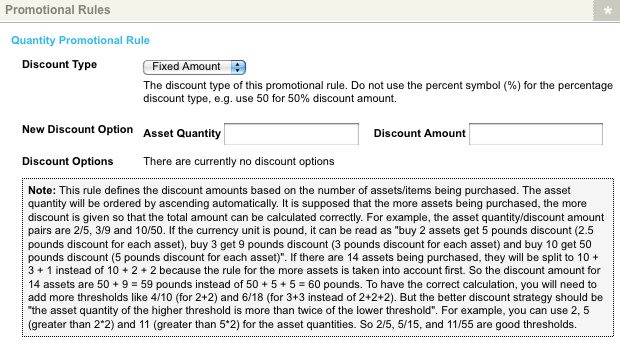 This section allows you to configure rules to define the Promotional Code discount. The Promotional Rules section of the Details screen is shown in the figure below. The Free Shipping Promotional Rule allows you to configure a full discount on the shipping of a user's e-commerce order, determined by a threshold on either the total cost of the order or the number of items being purchased. This rule can be used, for example, to create a Promotional Code that provides free shipping when the total cost of an e-commerce order is $50 or greater. Alternatively, you could configure a Promotional Code to provide free shipping when two or more items have been purchased. Delete Rule: select this checkbox and click Commit to delete this rule. Amount: the discount will be applied based on the total cost of the order. Quantity: the discount will be applied based on the number of items on the order. Quantity/Cost Threshold: specify the threshold of either the total cost or the total number of items of the order. This will determine the minimum amount/quantity, after which the free shipping discount will be applied. Tip: Set the Quantity/Cost Threshold to 0 (zero) to provide free shipping when users enter the correct Promotional Code, regardless of the cost of their order or the number of items purchased. The Quantity Promotional Rule allows you to define the discount of the Promotional Code, determined by the number of items that are being purchased. Fixed Amount: a specified monetary amount. For example, a $10.00 discount. Percentage: a discount amount specified as a percentage of the price. For example, a 10% discount. New Discount Option: specify the amount discounted on an item quantity. For example, you can configure a Discount Option so that when a customer buys 2 items they will get a 5 dollar discount. Asset Quantity: the number of purchased items required for the discount. Discount Amount: the discount amount granted. This value will be interpreted as either a monetary amount or a percentage, depending on the Discount Type specified. The Promotional Code asset calculates the Discount Options under the premise that the more assets purchased, the greater the discount. For example, if you have created Discount Options to provide customers with a $5 discount for 2 items purchased, $9 for 3, and $50 for 10. If a customer buys 14 items, their discount will be calculated as $50 (discount for 10 items purchased) + $9 (discount for 3 items purchased). This discount is not calculated as $50 + $5 (discount for 2 items purchased) + $5 (discount for 2 items purchased) as the Discount Option for the larger number of assets is calculated first. Discount Options: this field lists the Discount Options that have been configured for the promotional code asset, as shown in the figure below. To delete a Discount Option, select the Delete? field for the corresponding option and click Commit. Tip: You can set a discount on an Asset Quantity of 0 (zero) in order to provide a flat-rate discount when users enter the correct Promotional Code, regardless of the number of items purchased. Consider the following examples, in order to set up a Promotional Code on your e-commerce store. You can configure the size of the Promotional Code field and the displayed button text on the Display Formatting Options screen of the Checkout Page asset. The keyword replacements for the Promotional Code field and button are appended to the Confirmation Bodycopy of the Checkout Page asset. 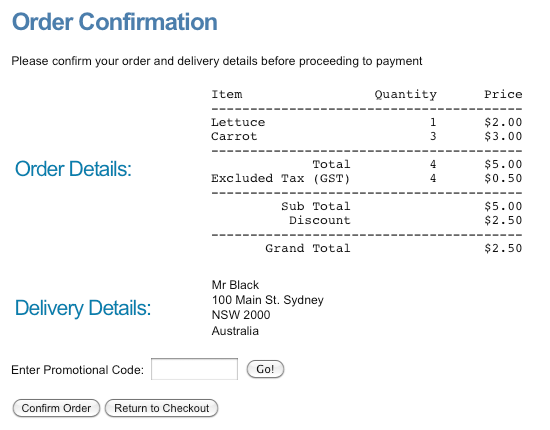 In the example below, a user has selected to add one lettuce and three carrots to their cart. When the user clicks the Proceed to Checkout button, they will be taken to the Checkout Page asset, where they can review their order and input their delivery details before proceeding to the order 'Confirmation' page. While confirming their details, users can input a promotional code to append to their order. The and keyword replacements can be used on the Receipt Bodycopy of the Checkout Page to display the amount discounted on the e-commerce order and order grand total (the order total, minus the discount). When creating an e-commerce system using an Ecommerce Form Page, Promotional Codes must be linked to the form using the variables specified in the Asset Purchase section of the Ecommerce Form Contents Details screen. In the following example, the Asset Promotional Code Request is set to promo_code and the Promotability Source is set to , as shown in the figure below. Products can be sent as POST requests to the Ecommerce Form Page, with the promotional code entered either before or after the product is added to the form. Tip: You will also need to configure the Asset ID and Asset Quantity Request Variables as well as the Price and Multiplicity Sources of the Ecommerce Form Page. For more information, refer to the Ecommerce Form Page and Product chapters in this manual. In this example, we have an Ecommerce Form Page with item selection fields and a Promotional Code input field. This allows users to enter a promotional code at the time of selecting the items they wish to purchase. 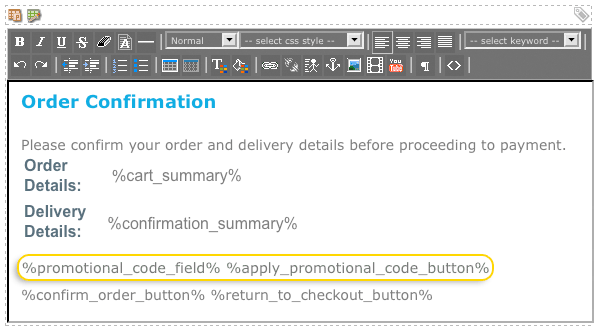 The code shown in the figure below is used on the Form Bodycopy of the Ecommerce Form Page. The asset IDs and names of the products have been added to the code, as highlighted in the image above. The Asset Promotional Code Request Variable has also been used in the code, highlighted in red. 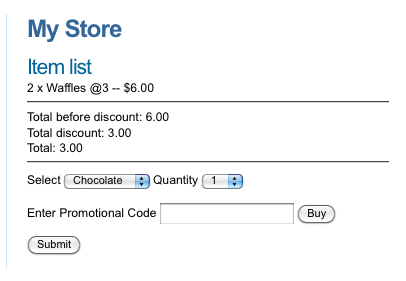 In the example below, the user has selected to purchase two Waffles and has entered a 50% off promotional code. When this user clicks the Buy button, the page will be updated with the total cost of their order and the discount they are receiving. The user can then click the Submit button to proceed to checkout. In this example, we have a products page with item selection fields, linking to an Ecommerce Form Page. This form page contains a Promotional Code input field, allowing users to enter a promotional code to append to their order. The code shown in the figure below is used on the Page Contents Bodycopy of a Standard Page. The asset ID of the Ecommerce Form Page and the asset IDs and names of the available products have been added to the code. Condition: Asset ID. This is the ID of the Ecommerce Form Page. Condition: Request Method. Select the POST HTTP Request Method. Actions: Set Session Var Trigger Action. 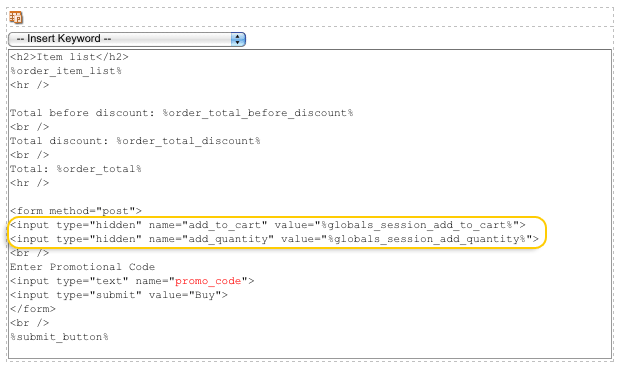 Set the session variable name to add_to_cart and create a new Value parameter with the POST Variable Name add_to_cart. Actions: Set Session Var Trigger Action. Set the session variable name to add_quantity and create a new Value parameter with the POST Variable Name add_quantity. Once you have configured and enabled the Trigger, you can set up the Ecommerce Form Page. The code shown in the figure below is used on the Form Bodycopy of the form. 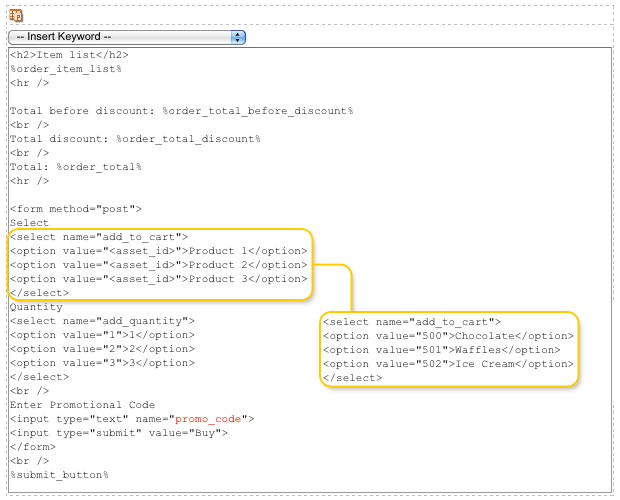 The add_to_cart and add_quantity session variables have been added to the code, as highlighted in the figure above. The Asset Promotional Code Request Variable has also been added, highlighted in red. Tip: You can change the hidden session variable fields to text fields to check that the correct asset ID and quantity amounts are passed to the Ecommerce Form Page. In the example below, the user has selected to purchase two Waffles on the products page. When this user clicks the Buy button, they will be taken to the Ecommerce Form Page, where they can input a promotional code.